Those of you who notice these things will notice that the due date has changed on my pregnancy calendar. We had a sonogram yesterday and the baby's size is 16 weeks...doesn't really surprise me all that much as my cycle has never been the textbook 28 days (32, 38, 45...I once had a 60 day cycle:) At least no one will be rushing me to have this baby before the right time. And before you ask, no we don't know if we're having a boy or a girl. 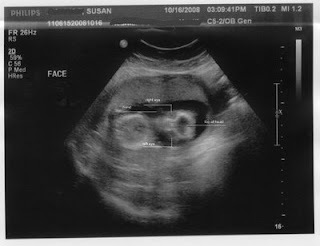 Click on the sonogram picture for a closeup. I've labeled the pertinent parts. What a beautiful first photo of your baby! Congrats again! Do you have an email address? The one I have for you keeps bouncing back.